After giving Nemo3 a try last time I felt it would suit well our current meta. I need much more practice with that list and that day was a perfect opportunity to do so against Mateusz. Due to recent changes to Irregurals his list differed from what can be now played. 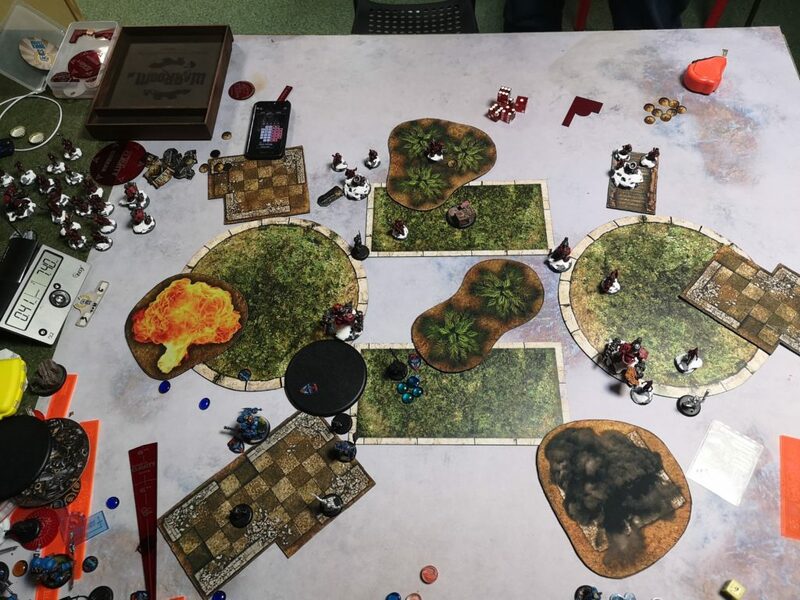 Unfortunately, Mateusz won the starting roll, what gave him huge advantage in this match up. I decided to take a side without a huge forest in front of the deployment zone. 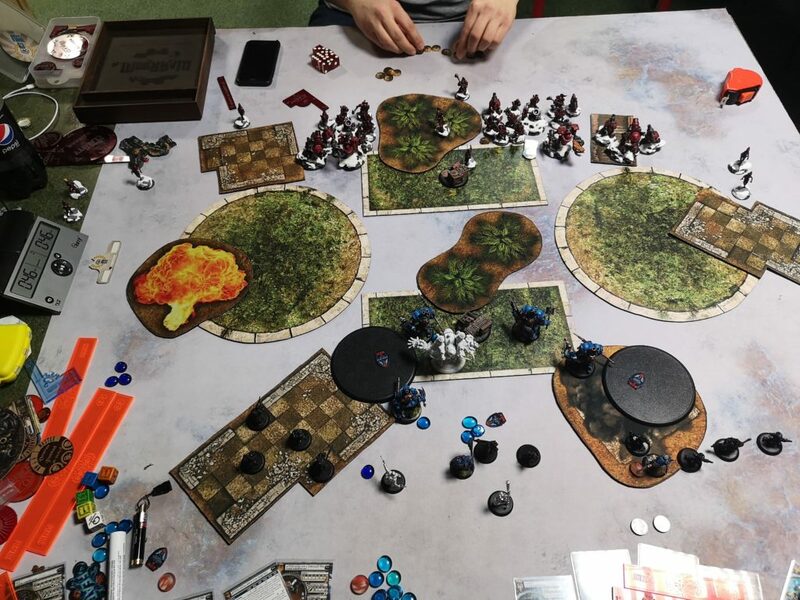 Mateusz deployed his forces symmetrically, spreading his forces equally. Driller, Basher, 2 Blasters, Mortar, Forge Guards and Eliminators on each side. I deployed Storm Strider on each side. Nemo and Finch were in between with a Thead on the side. All Fireflies found its place in the middle part too. Caine0 had Thead in FFE range. Mechanics were put next to my battle engines. Mateusz ran everything forward and put Fire For Effect on right mortar. Everything was outside of my threat ranges. I put Electrify on the left battle engine and Magnetic Field on Nemo. Caine put FFE on Thunderhead and positioned for the next turn. Hiding behind my models was a must against Eiryss with an access to Snipe, I had to get rid of her as soon as possible. Junior put Arcane Shield on the right battle engine. Everything else ran forward and stayed outside of threat ranges. Mateusz decided to feat and jam me with his heavy armoured warjacks. That was a pretty aggressive move, but definitely the way to go. Because of that I had a tough nuts to crack now and contesting the zones was one of them. Scoring a point in that situation was much more difficult than that, maybe I should have focused on that, rather than killing the opposing army. I gave pathfinder to Thunderhead and first of all I needed to make space for him so he could fry as many models as possible. I activated Nemo and used my feat. 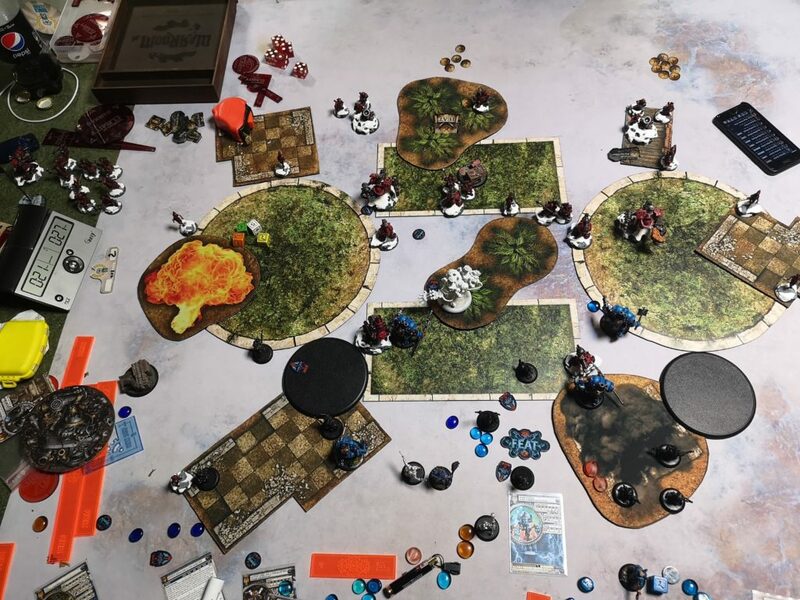 In the process of freeing up my models and clearing my rectangular zone I have sadly fried my Objective giving one point for free… Caine0 and Ace had one job, to Trick shot Kell and Eiryss to death. Somehow only Eiryss died, really bad rolls were involved 😛 I freed up Thead and moved him forward. 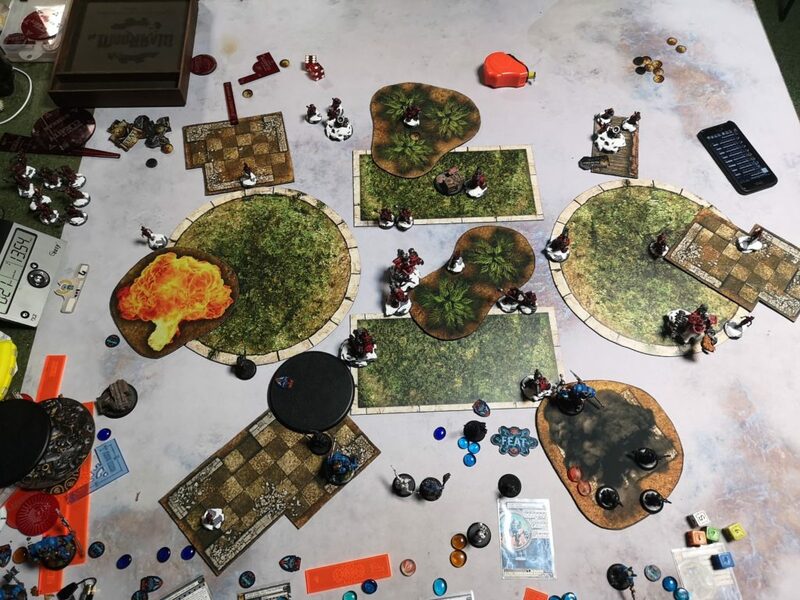 He zapped many hammer dwarves and dealt significant damage to surrounding models. Pulse with feat and FFE is a thing! I managed to get rid of one Basher in the right circular zone. I also managed to disrupt couple of jacks. 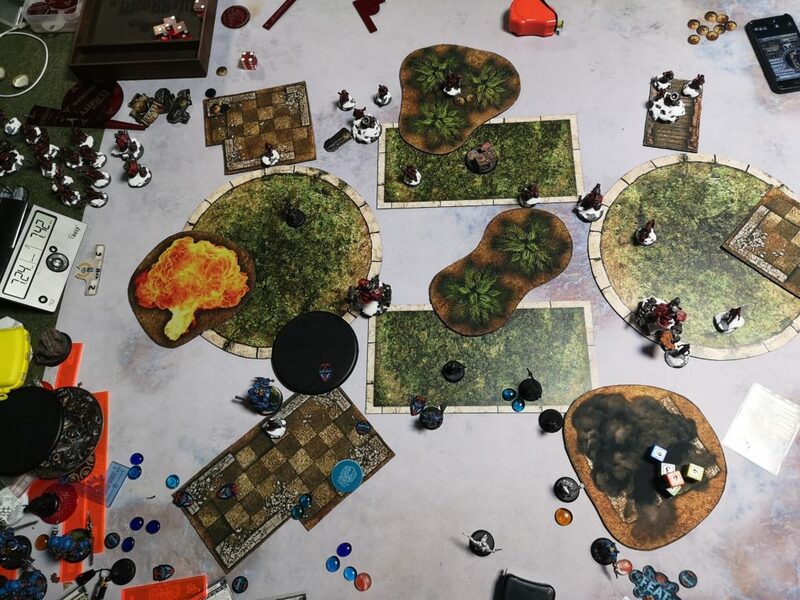 Both battle engines contested the circular zones, but since Rhulic jacks cannot be pushed, killing at least one BE shouldn’t be an issue for Mateusz. 0:2 in Mateusz’s favour. Well, I didn’t score any point and Mateusz was about to annihilate my army in return. That definitely wasn’t going good for me. Left mortar accompanied by Disrupted Driller, 2 Blasters’ sprays and Ragman’s aura made sure my Thead wouldn’t survived this turn. Mateusz also cleared the right circular zone entirely ensuring another point for himself. 0:4 in Mateusz’s favour. Unfortunately, Caster Kill was out of the question, Mateusz knew that could be my only chance. I had to score points and the easiest solution was to clear the left circular zone and my rectangular zone. One of the mechanics run next to the Eliminator so I could arc an electro leap into her. I also finished already damaged Basher, Blaster and 2 hammer dwarves in my zone scoring 2 points, 2:4 in Mateusz’s favour. Mateusz continued sealing his victory by easily clearing 2 zones and scoring 2 more points. The Driller couldn’t kill the left battle engine. 2:6 in his favour. I slammed Driller out of my zone and contested the rest. I did that only to score one more scenario point, as I knew that the fate of this game is already decided. 3:6. 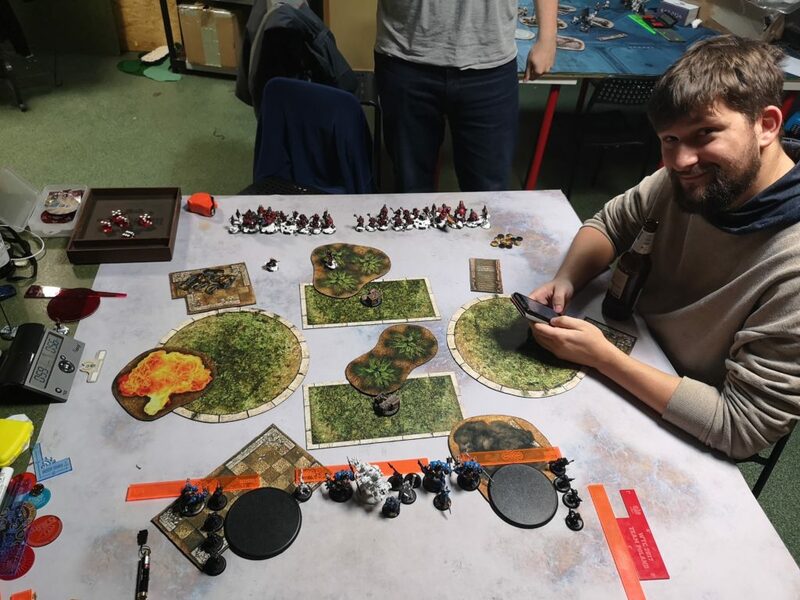 Mateusz killed 2 contesting models and won the game, 3:8. The most important thing about this game happened before we even deployed our models. The starting roll in this match up is way too important. 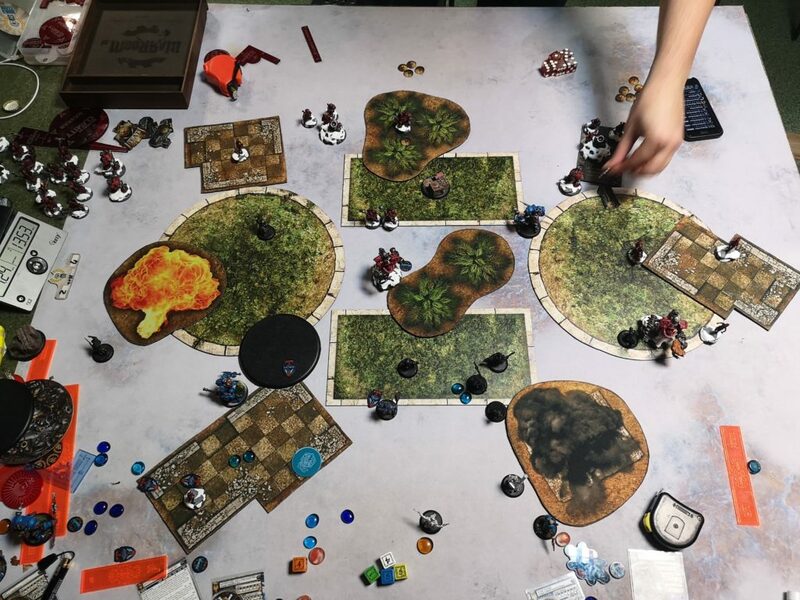 Playing only in the middle part of the table helps the opposite player to jam my army. Blocking myself with two Striders on the flanks wasn’t the best solution in this match up. 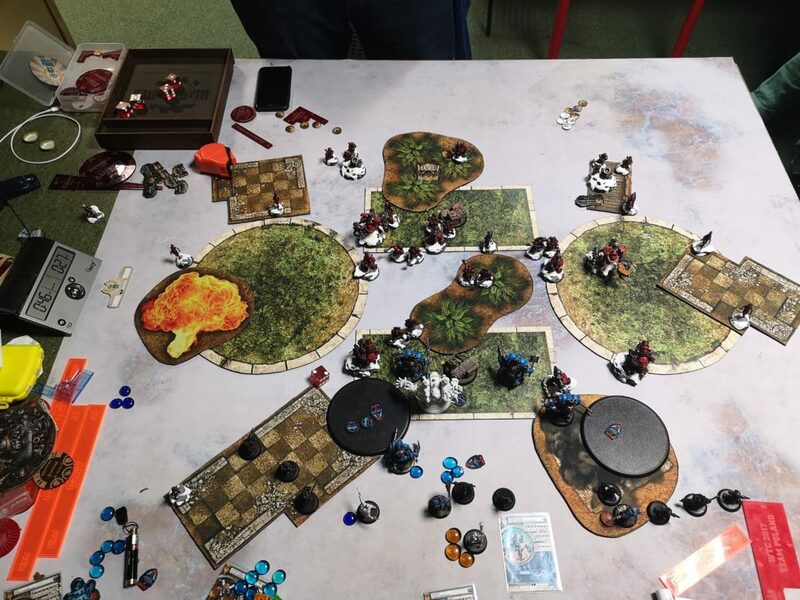 Mateusz, by running with his models in the middle of my army, blocked most of my ranged potential and forced me to focus on those blocking models, instead of those that were the real threat. I should have played wider.